Most homeowners install French doors in their house as pairs to create a large entryway to the outside world. These doors also offer an excellent view of the world through combinations of window paneling. However, don’t allow these generalized descriptions prevent you from finding out the other benefits of these doors Since these doors are available in different shapes, styles, and sizes, it’s hard to select a door that best fits your home. The French doors are built with either fiberglass or wood surrounding the window panes. Wood trim is preferred in a residential setting because it gives a soft interior look and can be easily painted or stained in any color or shade. Fiberglass French doors are also beautiful as they offer a modern and clean appeal. Also, they are extremely durable and can be painted in any color of your choice. Today, many households use a combination of aluminum trim and wood door to give their entryway a unique design. Another unique feature of these doors is their glass paneling. These doors give you limitless artistic designs and colors. Some of the options you can choose from include small panes, stained glasses, multiple panels, etched glasses, textured glasses, and several other unique and exciting options. If you feel that installing a French window can make your home vulnerable to the outside world, you can opt for drapes, blinds, slatted shutters, or curtains to protect your privacy. When you install French door in your home, you get an opportunity to expand the look of the door by placing windows on the sides or overhead of the doors. This will help in extending the view of the unit. When selecting the glass for your door and window, there are unlimited designs and materials you can choose. Since the majority of doors and windows are constructed of glass, there is an increased threat of breakage. When choosing the type of window you want to install, you could consider using impact windows. Hurricane windows or storm windows are durable windows protects your home from hail, debris, and the wind. These impact-resistant windows have the strength to counter high-velocity objects and hurricane winds without fracturing. Also, these windows are insulated which prevent high utility bills and energy leakage during both winter and summer. No wonder, most homeowners who take up window replacement projects prefer impact windows as replacement windows. Even though most French doors are hinged and paired, there are several new designs to make your entryway unique. Folding DoorMany homeowners install multiple French doors to create a large outside view. When you open the doors, it opens up the area and removes the entire wall. 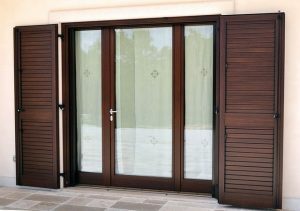 Sliding DoorFrench doors are considered a great alternative to traditional doors. You don’t have to worry if you have a patio or indoor furniture near the door. All you have to do is install a sliding door, and you only need to push the door to open or close. It takes less space and is easy to install. These sliding French doors are especially useful for balconies that have limited space.